The Chinese Assault Rifle is some manner of AK Russian assault rifle, perhaps Chinese-made, however. This model is from STALKER, specifically the STALKER mod by TOXA. Unlike my other mod, which requires his, this has all of the assets packaged with it and is good to go. 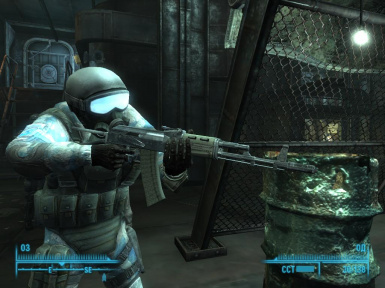 The rifle is named "Russian Assault Rifle", to fit in with the vanilla FO3 naming, takes 5.56cal (closest to IRL, and so it uses same as Chinese rifle), and is found in Jericho's house (on the shelf on the left as you enter, top shelf). It has real-world firing speed, and a slight boost to damage over the Chinese Assault rifle - this puts it just a bit above the Chinese Assault rifle in damage, making it effectively a unique version with it's own model and stats. I feel this fits quite well in the FO3 world. I was having crash issues with my STALKER Rehash mod (probably a conflict with one of the other mods I have enabled) and really just wanted to use the AK74, so I created this as a workaround for myself, and perhaps others who don't want so many things added, etc.. Enjoy it, guys. Credit as appropriate to TOXA for the model and texture port from STALKER, the rest of the work by me, Yushatak.